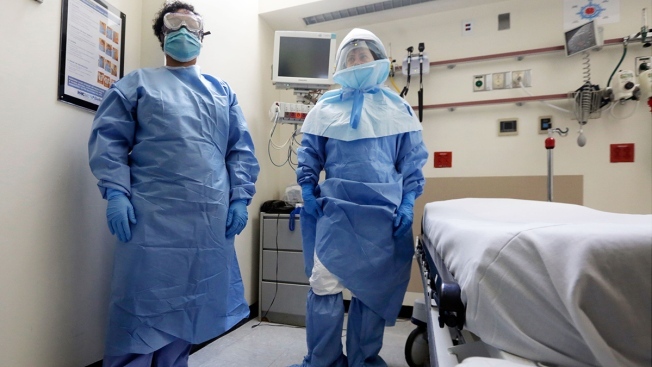 FILE - Two workers at Bellevue Hospital in New York pose in protective suits in an isolation room during a demonstration of procedures for possible Ebola patients. The CDC released new guidelines for protective gear for health care workers handling patients with Ebola on Monday. Health officials have released long-awaited new guidelines for how health workers should gear up to treat Ebola patients, calling for protective garb that covers their bodies entirely and for trained monitors to supervise them as they put on and remove it. UpdatedDallas Nurses: "This Could Happen to Any Hospital"
—Use of protective garments, hoods, face shields, double gloves, face masks or respirators and other protective equipment to cover every square inch of a health worker's body. —A call for health workers who may be involved in an Ebola patient's care to practice repeatedly and demonstrate proficiency in donning and doffing gear before ever being allowed near a patient. —Placement of a trained hospital employee to supervise all aspects of care in an Ebola patient's room and watch that all health workers put on and take off gear correctly. Dallas Judge: Treat Ebola Contacts with "Respect"
Jallah's mother's fiance, Thomas Eric Duncan, was the first person diagnosed with Ebola in the U.S. He died Oct. 8. While health workers cleared Jallah of having Ebola, the disease's stigma lingers — including among fellow Liberians, she said.